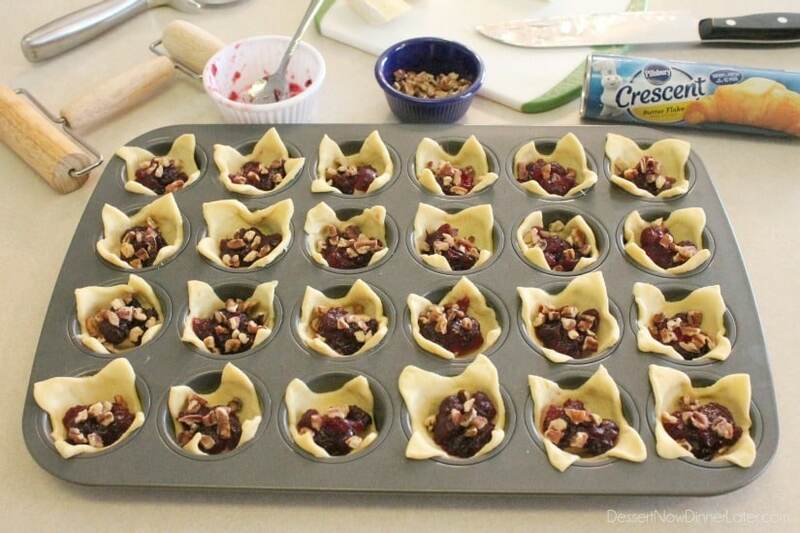 Cranberry Brie Bites - Dessert Now, Dinner Later! Cranberry Brie Bites are an easy 4-ingredient appetizer for your holiday party. Plus they taste amazing! Things have been a little bit crazy around here! I had a baby 5 months ago and my husband got a new job which means we have sold our house and moved into an apartment while we build a new house closer to my husband’s work. I’m still up to my ears in boxes, which we’ll be packing back up in 6-ish months when our house is done, and we are all adjusting to our temporary normal, so bear with me as far as blogging goes. I’m dying to get back to it regularly, but since I only have limited time, I’m only going to be sharing the best of the best recipes! Even amongst all the new adjustments going on right now, I’m super excited for the holidays! Family and holidays make me feel giddy no matter our situation, and my favorite part about holidays is the food! My husband and his family grew up eating Brie cheese as an appetizer each Thanksgiving and Christmas. He said they would have a plate full of crackers, Brie cheese, and fruit, like apples and pears to munch on. It’s something he cherishes about his childhood. 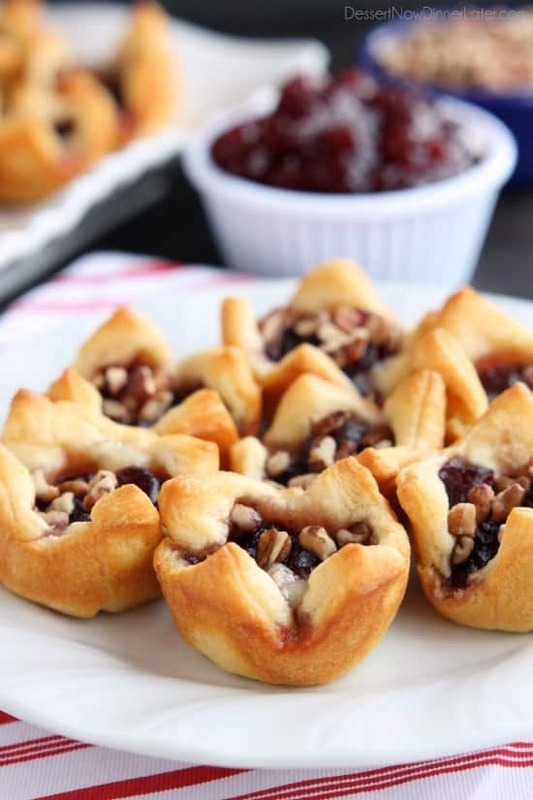 So, I thought it would be fun to incorporate the Brie cheese that he loves into a bite-size appetizer with little crescent cups and cranberry sauce, because hello! It’s the holidays, and cranberry sauce is a tradition in both of our families, so we married the two flavors and got this recipe. The only other ingredient is pecans for a little bit of crunch. 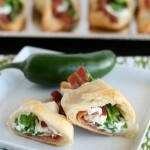 My husband thinks crispy bacon would be good on top too, but I’m not so sure about that one, haha. Try it if you think it sounds good! Let me show you how easy these are to make. 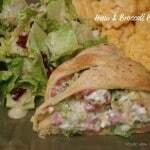 The Pillsbury Crescents® are the key ingredient here. 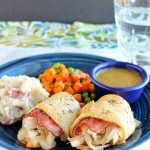 They add a buttery flavor and hold everything together for the perfect bite. They are crisp on the outside and soft on the inside when warm from the oven! I, for one, fight over the crescent rolls at the holiday dinner table. I love the buttery, flaky, deliciousness of those darn things! So, you know, grab a couple extra tubes to serve with dinner too. 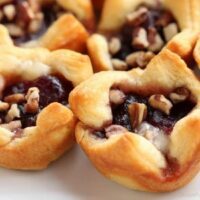 First things first, pick up your Pillsbury Crescents® at Walmart, along with some whole cranberry sauce, Brie cheese, and pecan pieces. 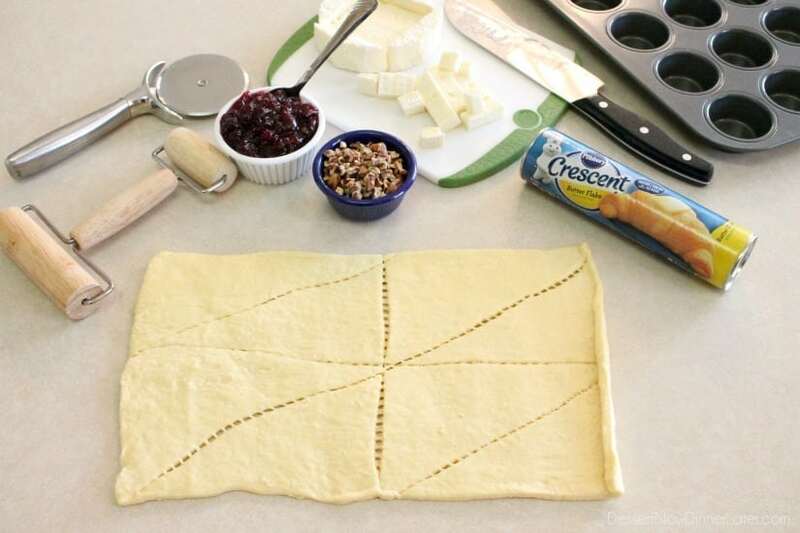 Open the tube of Crescents® and unroll the dough into one large rectangle. 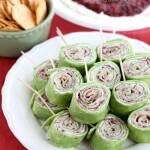 Use a rolling pin to roll the seams together and lengthen the dough a little bit. Cut 24 squares with a pizza cutter. 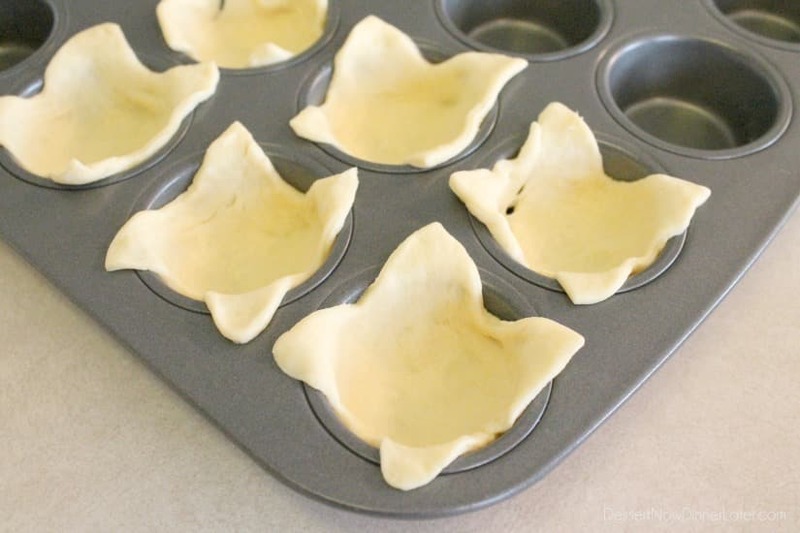 Place one square inside each cup of a mini muffin pan. It’s okay if some of the seams come apart, they will most likely cook together. They don’t have to touch the bottom either. I like to leave a little bit of the dough hanging out of the cup for easy removal after baking. Remove any rind from the Brie cheese and cut 24 to 48 square pieces. If you’re using all of the cheese you will make 48 and need a second tube of Pillsbury Crescents®. 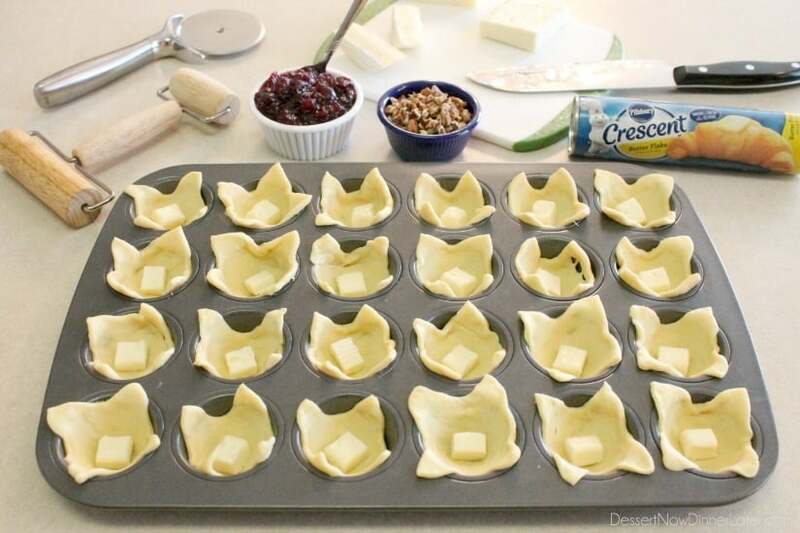 Place a piece of cheese in the center of each crescent cup. Spoon some whole cranberry sauce on top of the Brie. Maybe a rounded teaspoonful. You don’t have to be exact, but don’t overfill them. 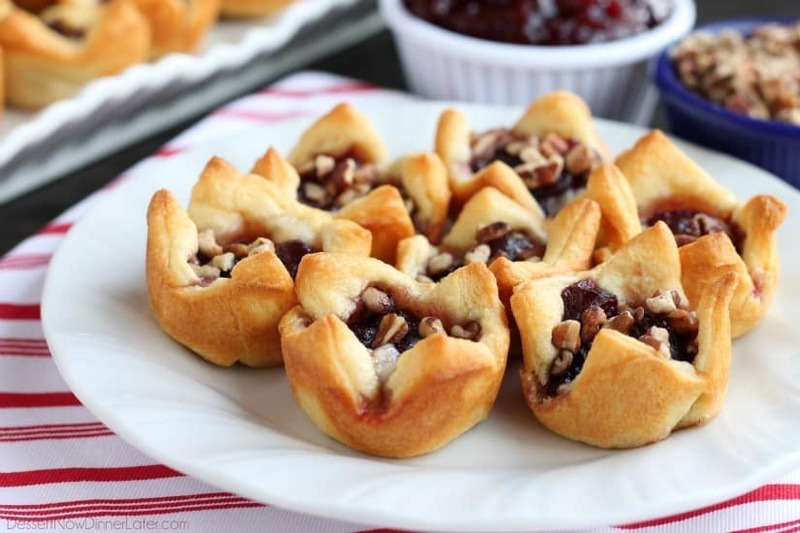 Top the cranberry sauce with chopped pecan pieces. Bake at 375 degrees Fahrenheit for 10 to 15 minutes, until golden brown. 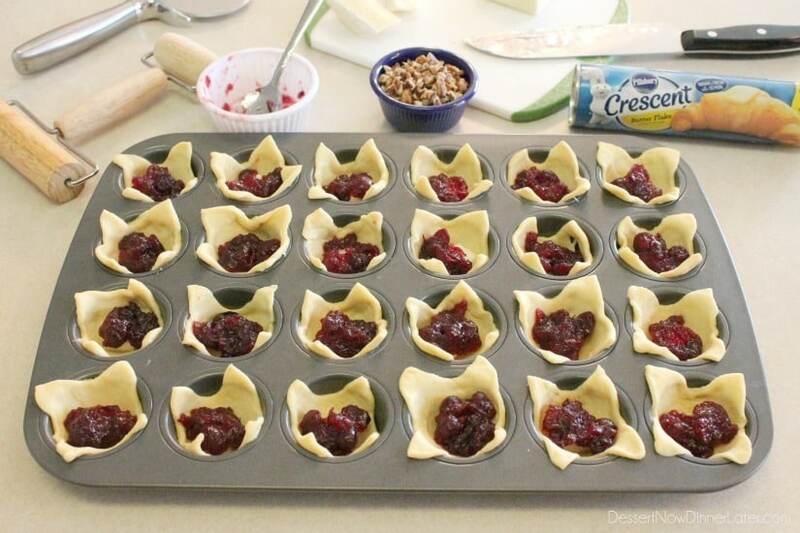 Repeat with another tube of Pillsbury Crescents® to use up all of the cheese and cranberry sauce. 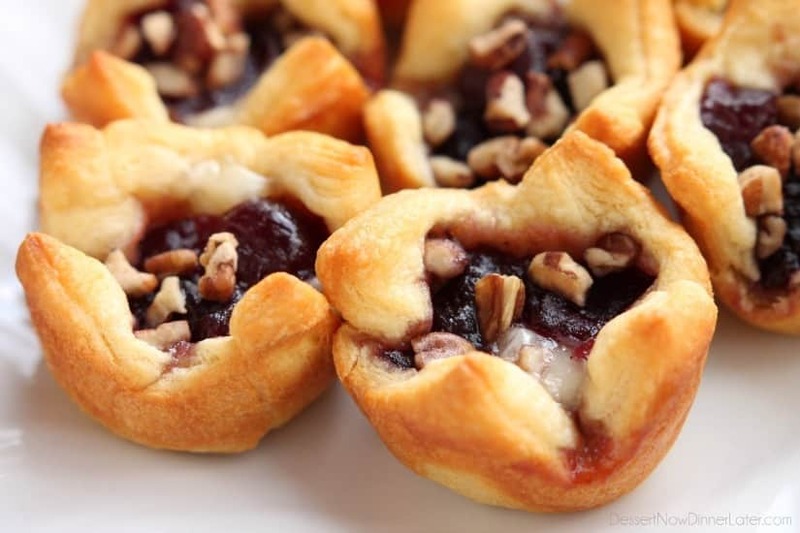 Believe me, you’ll want a lot because these Cranberry Brie Bites will be gone in a flash! 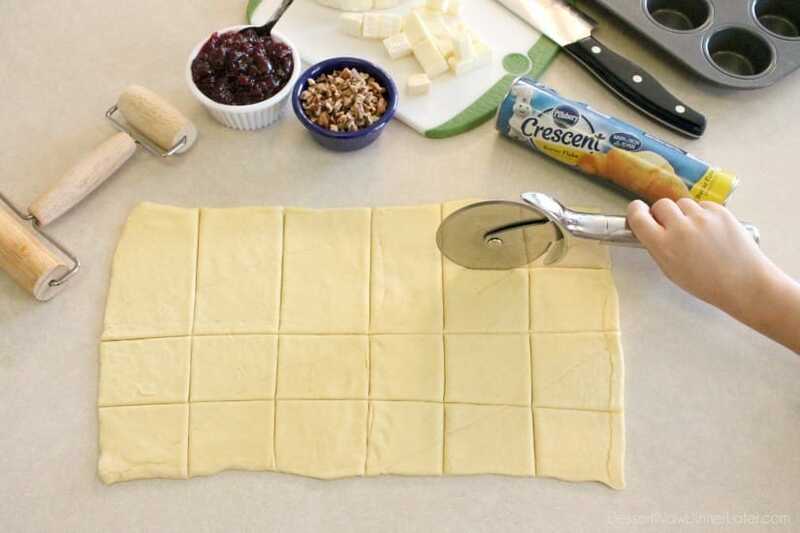 Unroll one tube of Pillsbury Crescents® into one long rectangle. Use a rolling pin to roll the seams together and lengthen the dough a little bit. Cut 24 squares with a pizza cutter. Remove any rind from the Brie cheese and cut 48 square-ish pieces. Place a piece of cheese in the center of each crescent cup. Save the remaining 24 pieces for the second tube of crescent dough. Top the cranberry sauce with chopped pecan pieces, saving half for the second batch of Cranberry Brie Bites. Bake at 375 degrees Fahrenheit for 10 to 15 minutes, until golden brown. Serve immediately using a spoon to remove the cups from their mold. Repeat with remaining ingredients.